Together with research and development partner IOHK (Input Output Hong Kong), ZenCash is building a Decentralized Autonomous Organization (DAO) treasury system. IOHK and Lancaster University collaborated on a prototype for this system with the importance of community-based funding decisions in mind. Currently, ZenCash (and a lot of other cryptocurrencies) still has a single core team managing expenses and decisions. This single point of failure can be a big risk when, for example, governments start to clamp down on privacy coins. 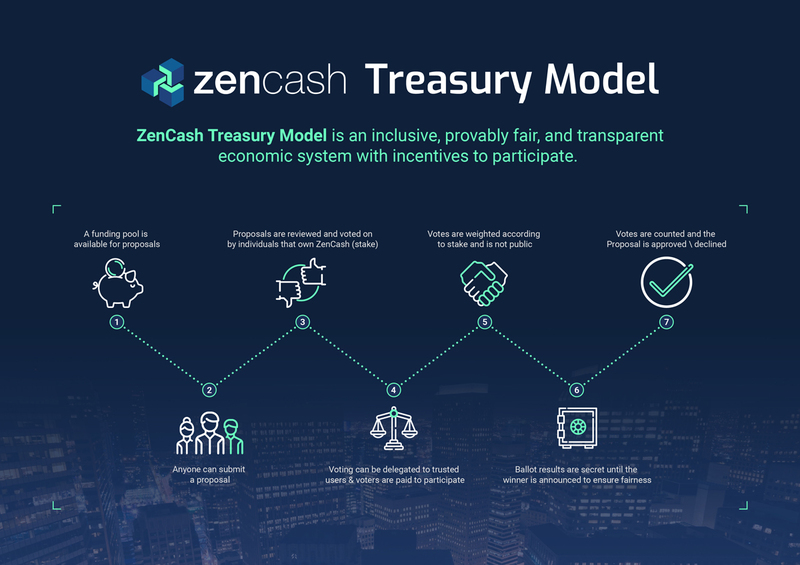 A decentalized treasury model will give anyone the ability to submit a proposal on improving the ZenCash platform. Votes will be weighted according to stake and will be cast privately. If you want to read more about the technical details of their prototype treasure system, have a look at their research paper.